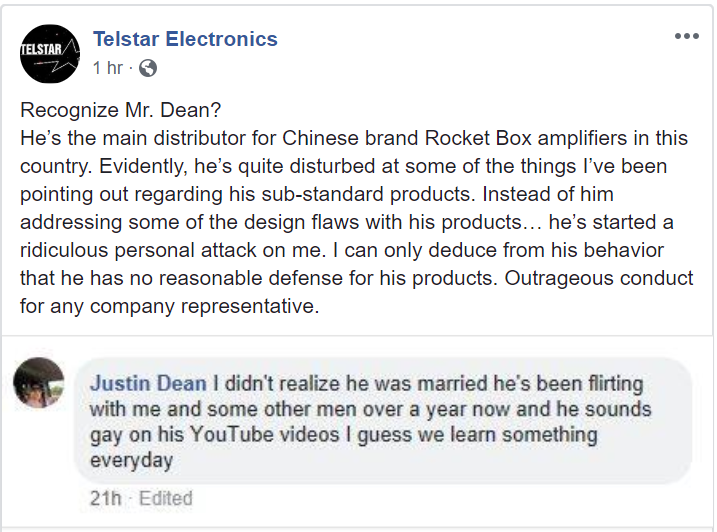 Telstar Electronics: I am being personally attacked by the owner of rocket box amps! Let me tell you how this works. Telstar attacked this man and his products first. Telstar attacks this man and his products on a weekly, if not daily basis. Now, he runs to Facebook to whine about it? If he simply pointed out the issues and left it at that then he might have an argument. When he made it his life mission to attack every other amplifier builder on the planet that’s when he asked for it. Now these guys are fighting back and he cries foul. Oh, the personal attacks! He should address his products! But Mr. Telstar is a damn satellite TV installer. He should stick to making sure people can watch Game Of Thrones, not judging amplifiers. He asked for it. Rock on Rocket Box!